The latest book in our New Atlantis Books series. Now in stores: Amazon, Barnes & Noble. Tomorrow has never looked better. Breakthroughs in fields like genetic engineering and nanotechnology promise to give us unprecedented power to redesign our bodies and our world. Futurists and activists tell us that we are drawing ever closer to a day when we will be as smart as computers, will be able to link our minds telepathically, and will live for centuries — or maybe forever. The perfection of a “posthuman” future awaits us. Or so the story goes. In reality, the rush toward a posthuman destiny amounts to an ideology of human extinction, an ideology that sees little of value in humanity except the raw material for producing whatever might come next. 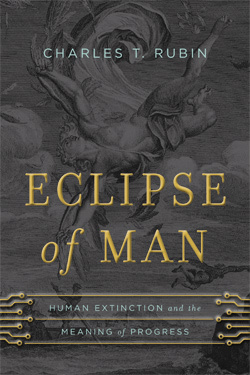 In Eclipse of Man, Charles T. Rubin examines intellectual precursors to the movement to perfect and replace the human race. He shows how today’s advocates of radical enhancement are — like their forebears — deeply dissatisfied with given human nature and fixated on grand visions of a future shaped by what they would call technological progress. Moreover, Rubin argues that this myopic vision of progressivism stands in stark contrast to the more nuanced pictures of the human future that can be found among thoughtful writers of fiction. By exploring and criticizing the dreams of posthumanity, Rubin defends a more modest vision of the future, one that takes seriously both the limitations and the inherent dignity of our given nature.